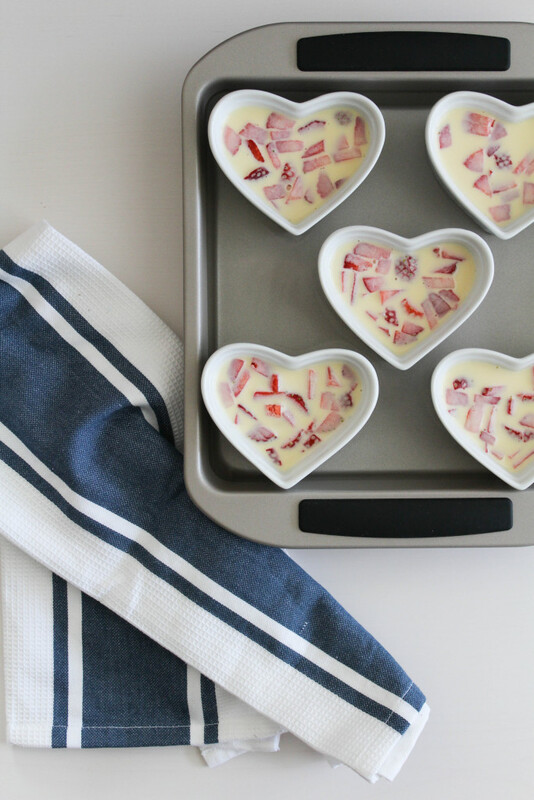 If you’re looking for the perfect dessert to serve for Valentine’s Day, an anniversary, or even just a Tuesday night, this little recipe is sure to a be a hit. And those heart shaped ramekins…? They sure do elevate the cuteness factor. I got my ramekins here. The recipe is simple to put together and can be done in about an hour and a half, from start to finish. 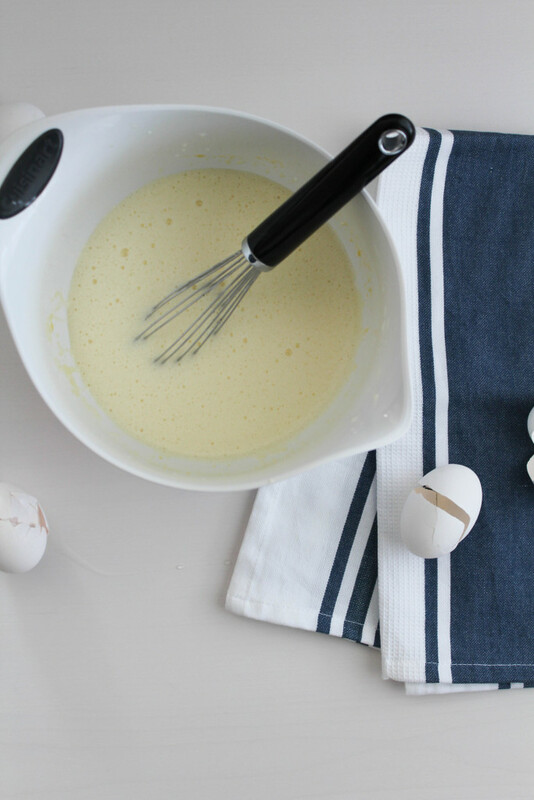 Whip together sugar, egg yolks, and vanilla until well blended. Heat the cream until just slightly simmering (about 190 degrees) and very slowly pour into the egg yolk mixture, while whisking the entire time. Fill the bottoms of the ramekins with strawberries. 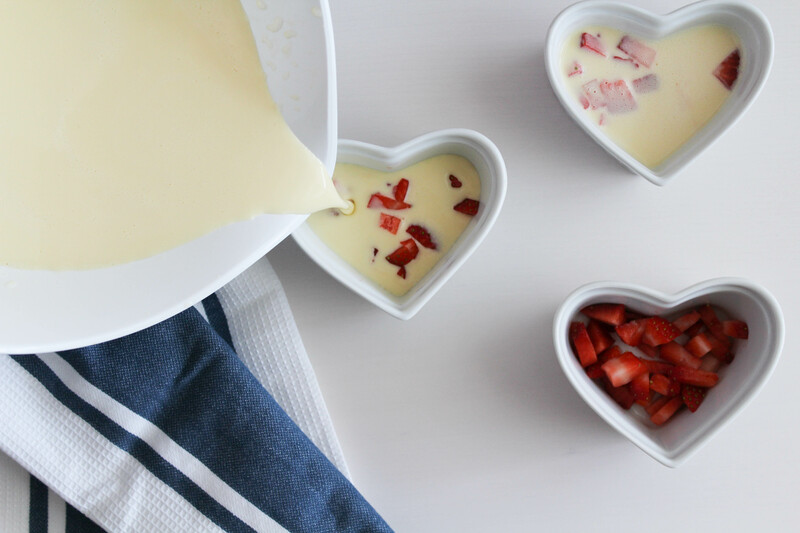 Remove any excess foam off of the top of the custard mixture and pour into the ramekins until they are about 3/4 of the way full. 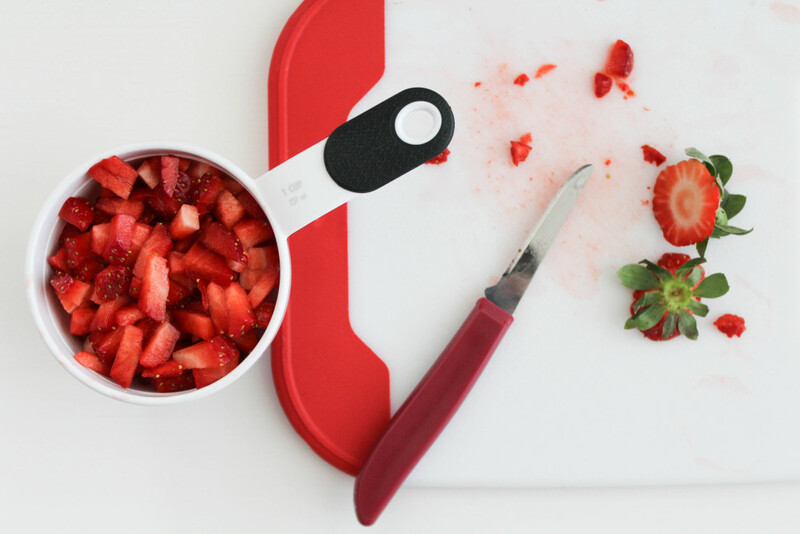 (The strawberries will float a bit in the mixture). Set the ramekins inside a non-stick baking pan and carefully pour water into the pan until it reaches about 1/2 up the sides of the ramekins. Place onto a middle rack in the oven and bake for about 20-25 minutes, until they have set and are no longer “liquidy”. Once done, chill for 30 minutes in the refrigerator. 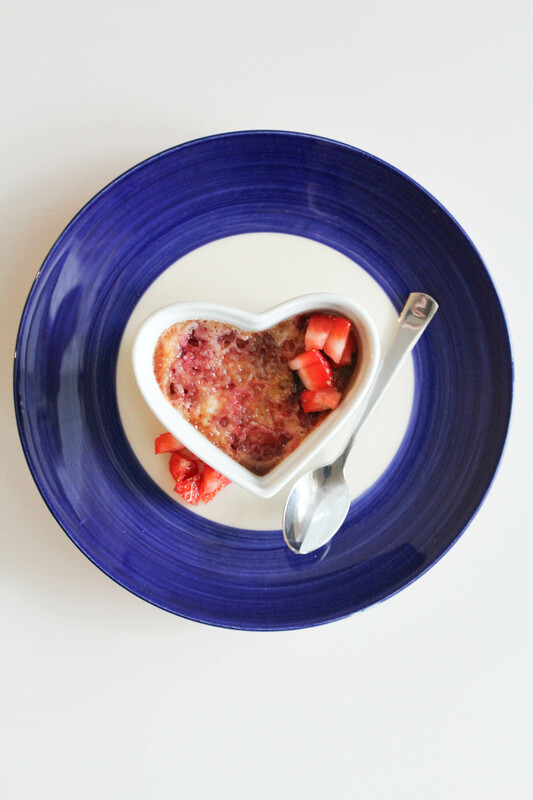 Sprinkle sugar over the tops of the chilled brulee. Using a kitchen torch, caramelize the sugar by moving the flame in a circular motion on the surface. 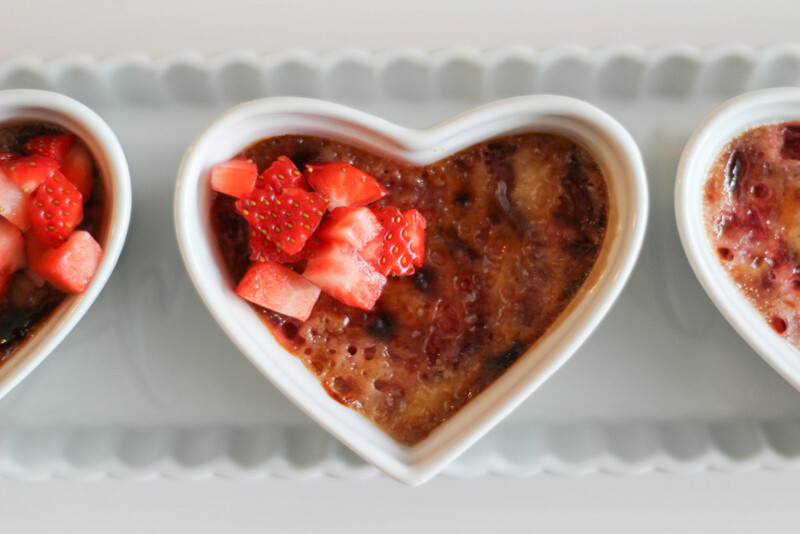 (If you don’t have a kitchen torch handy, you can cheat a bit by placing the brulee into your oven on the “broil” setting to help get a crusty top using the sugar. Be sure to watch it carefully though, because it can get very hot, very quickly!). 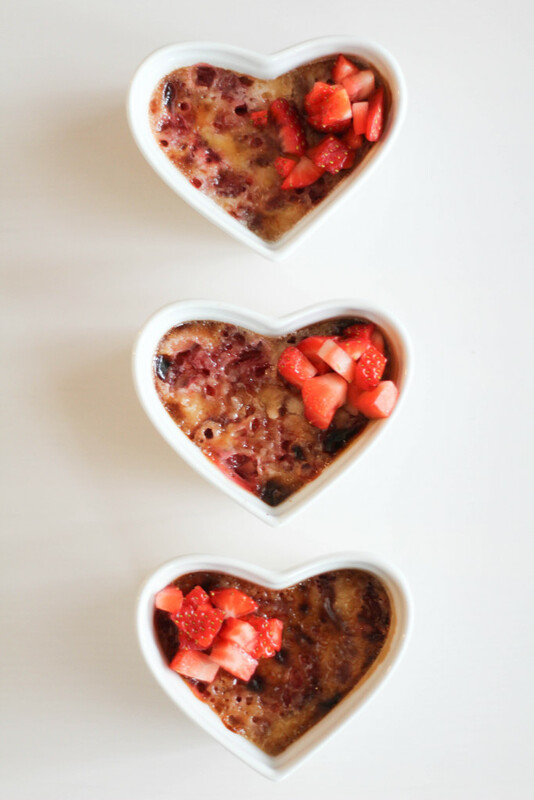 This recipe will make about 6 heart shaped strawberry & cream creme brulee’s. They didn’t last long at my house, so next time, I might need to make double!